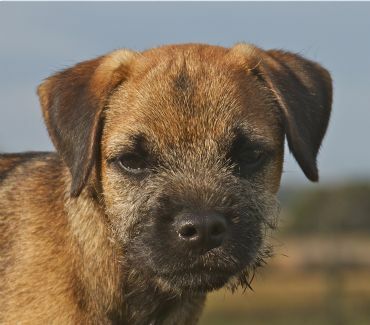 Our new kid at Glenbogle, Merlin came from Amber Riley - Mossrose Border Terriers in New Zealand. We can not thank Amber enough for allowing Merlin to come and reside in OZ. Thank you Amber. Merlin's year has kicked off with him winning Minor in Show under Jennifer Kealy-Ireland and then going on to win Minor In Show under Mrs Susan Kealy - Ireland at West Gippsland Kennel Assoc, June 2012. 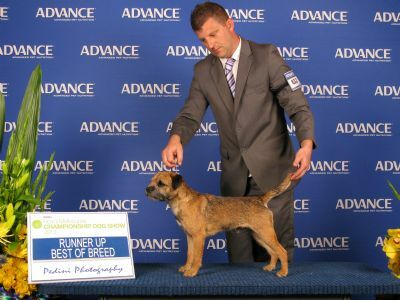 At the Border Terrier Champ Show, the next day 9.6.2012, Merlin then goes on to win Puppy In Show, under Mrs Susan Kealy - Ireland. what a week for this boy. Critique: very good for size and body shape, slim and well ribbed back, nice ears, excellent teeth and bite, good coat and moved well. Merlin does us proud at Royal Melbourne Show 2013, with Reserve Dog Challenge and Runner Up Best of Breed. Thank you to Lincoln for handling Merlin. 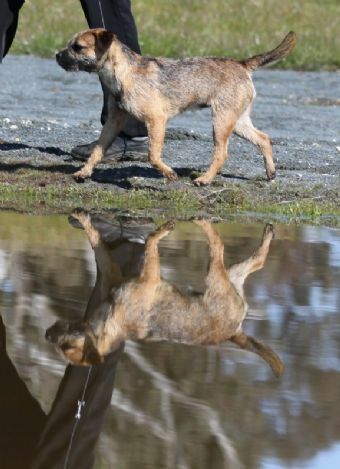 Merlin goes Intermediate In Show at the 2014 Border Terrier Champ show, under Mr Tony Syme. 5-Oct-13 Best In Group, Intermediate In Group, BOB.